Norwegian gas production hit a record in 2016, servicing more than 20% of European demand. But the role of Norway is set to decline into next decade. Norway benefits from low sovereign risk, commercial flexibility and close proximity to key gas demand centres. Norwegian exports to Europe hit a record 108.56 bcm in 2016, more than 20% of total European gas demand. But this may well have marked the peak in Norwegian market share. Norwegian gas production from existing fields is maturing and new gas is becoming more difficult to access. Norway is also cutting upstream investment expenditure, driven in part by a lower oil and gas price environment. Chart 1 shows a projection of Norwegian production, plateauing this decade, then declining in the 2020s. The chart also illustrates the pronounced Norwegian seasonal production pattern, which provides the European market with a key source of seasonal flexibility in addition to gas storage capacity. 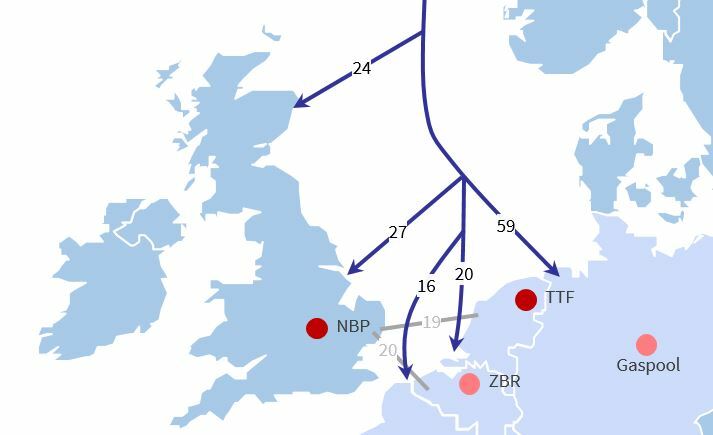 Diagram 1 provides an overview of the Norwegian pipeline network, which allows access to UK, Germany, Belgium & France. On average about 75% of Norwegian gas flows to the Continent, predominantly via long term hub indexed contracts. There is ample capacity headroom into the UK, but there can be constraints on flows into the Continent. 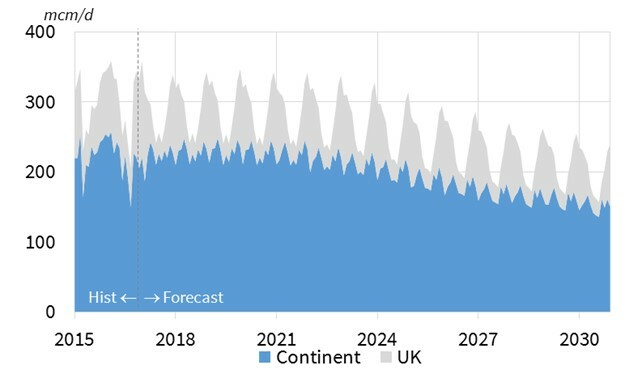 However flow volumes to the UK versus the Continent can fluctuate significantly, driven by factors such as LNG import volumes, weather patterns and power sector gas demand. The loss of the UK’s Rough storage facility has also had a major impact on flows. Norwegian exports to the UK are becoming more seasonal in order to ‘backfill’ lost storage deliverability across winter, while making way for UKCS production no longer injected into Rough across the summer. Hub indexation of long term contracts means Norwegian gas flows are driven by spot price signals. That is also true of the significant volume of uncontracted Norwegian production, which Statoil optimises against UK vs TTF/NCG/Zee hub price signals. This ability to optimise delivery across the multiple entry points shown in Diagram 1, provides important shorter term deliverability flexibility to the European gas market. The ability to arbitrage price differentials across hubs also underpins the structural price convergence across North West European hubs. But is Norway a contender in the evolving battle for European gas market share? In a word no. Norwegian export volumes are driven by an annual government production mandate that is set to decline as production matures. Norway will continue to be a key exporter to Europe for many years to come. But it will watch the evolving battle between Russian and LNG imports as a price taker from the sideline.